It had been a while, but I had a Scoopon Voucher it need of some using! The added bonus of this was that when the day before the Easter break rolled around, I just wasn’t that up for cooking – already in the mini holiday spirit I suppose. So I gave the Northwood Ale House a call and asked if I would be able to make a booking, using my scoopon for that evening. Not a worry I was told, so we were set for 7pm. I hadn’t been to the Northwood before, but I remember when we went to the bottle shop nearby a few months prior they had mentioned that they had done up the restaurant, so I was keen to see how it all looked, given it was quite close to home. We ended up walking in through the door near the Sports Bar, where I was pleased to see the footy on such a giant screen, but I suspected we weren’t in the right area for dinner. Luckily a friendly girl came over and sensing our lostness (tehehe I’m sure lostness is a word), directed us through the next room and into the dining area. They didn’t have a huge crowd this evening, there was us, another couple then two families in what was a very large room. The decor was fairly simple and the pub itself was quite dated, but the area did seem to have been given a facelift of sorts in recent times – with strategic curtins and brightly coloured couches. The waitress we had was an absolute gem. Really very friendy, which is always nice. She confirmed that with the exception of the rib eye, we were able to choose any entree, main and dessert each off the menu, plus we could share a bottle of white, red or sparkling. 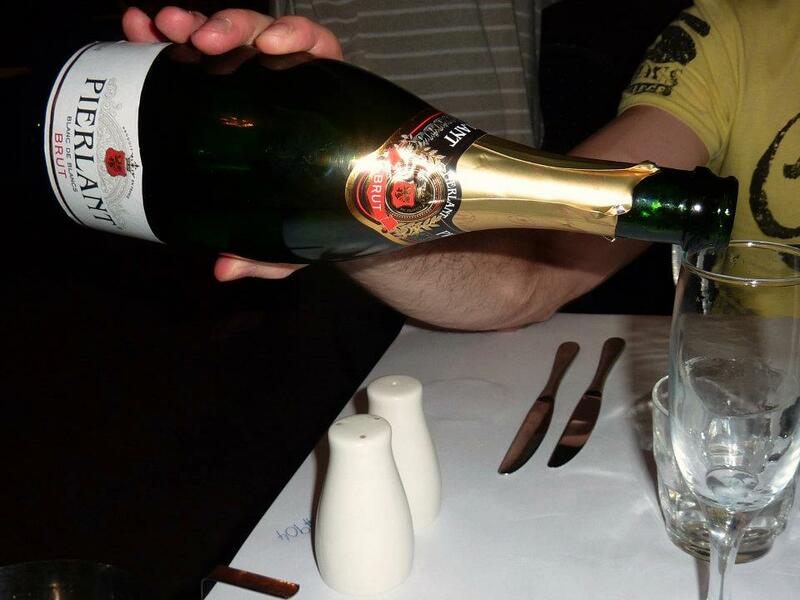 Let’s mix it up we thought and celebrate this Easter break with some bubbles. It was a decent drop, nothing particularly flash, but not offensively sweet, so that was a plus. On the food front there was a decent range available, both for starters and for mains. For entrees I ordered the Chilli Salt and Pepper Calamari, deep fried and served with roasted garlic aioli dipping sauce – $14.50, while GG went for the Grilled Chorizo in a mildly spiced tomato sauce, served with crusty bread ($10.90). Timing wise they were both brought out to us quickly, which was a plus because I was pretty hungry. Both were a decent serving size. 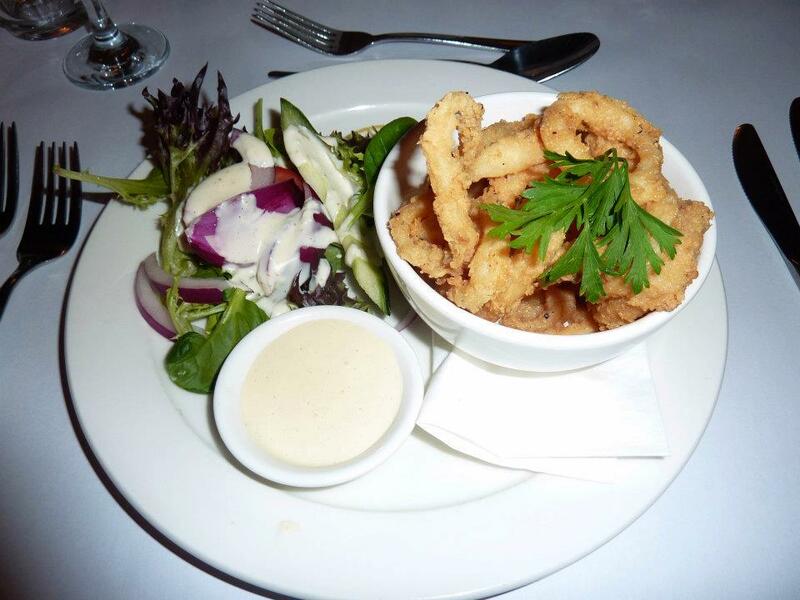 Despite being deep fried the squid was perfectly cooked and had a good crispiness to it. Not as all oily or chewy. It was a nice starter and the aioli made for a pleasant dipping sauce. Across the table was the chorizo. Again couldn’t really fault the amount of chorizo that came in the serve and it had a nice flavour to it, but either the sausage or the sauce needed a bit more zap. 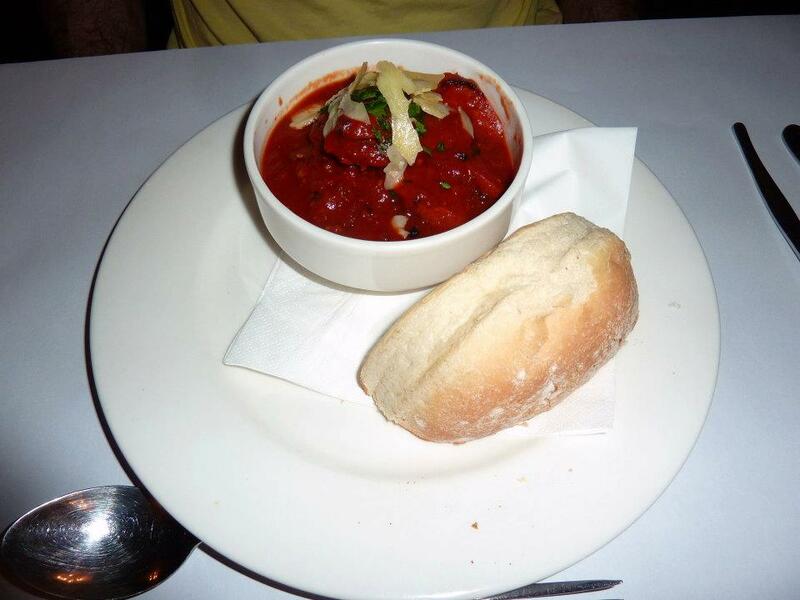 Perhaps given that it had said it was only ‘mildly’ spiced tomato sauce we should have been less surprised and hey I didn’t mind it and it was still nice with the crusty bread, but I think it could be a tastier dish with a little more seasoning to the sauce. The gaping void of hunger that I arrived with had been suitably dented before it was time for mains. We had decided to order two and split them, with the halving weighted towards GG, because that’s just good maths, he’s a growing lad. I started with the Chicken Supreme – Roasted Chicken Breast filled with mushroom duxelle, wilted spinach and macadamia nuts. 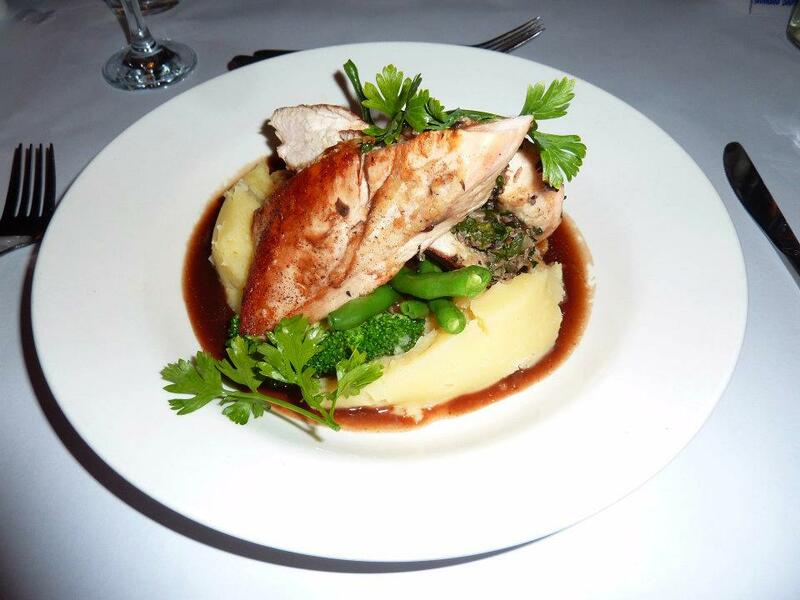 Served with creamy mashed potato, steamed greens and jus – $26.90. It was a big bit of chook and the mushroom filling was really delicious. My big concern with a piece of chicken that size was that it was going to be really dry, but they’d done a great job with it. The mash, greens and jus were common to both mains, and I liked a good mash and this was a good one. Real spud, so bonus marks right there. The greens were perfectly crunchy and the jus enhanced the flavour. I don’t often order a chicken mains, but I was pleased with this. So given the similarity on the vegetable front, all that was required for our split was to exchange some chicken for some of the steak. 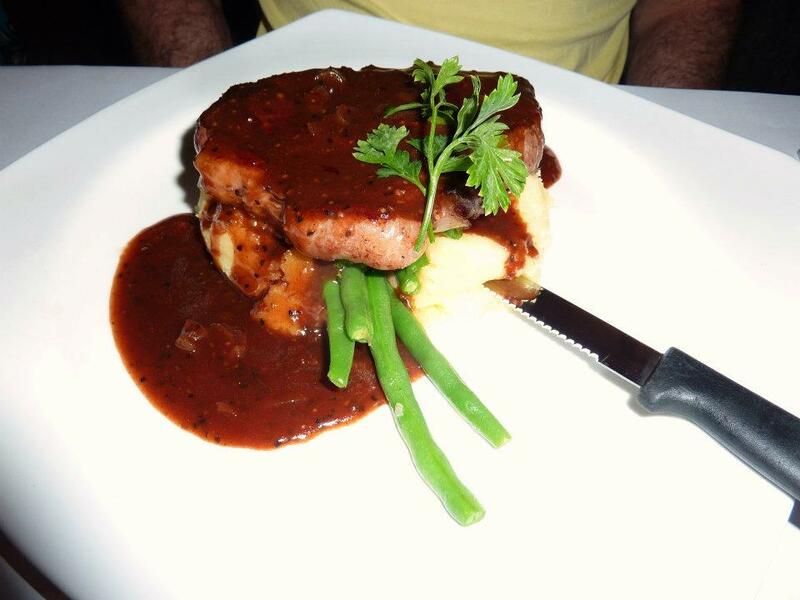 Grilled Sirloin Steak – Grilled and served on a bed of creamy Mashed Potatoes with seasonal greens and your choice of sauce – $27.50. I’ll admit that eating half the chicken I wasn’t starving for steak, but I tried it and it was cooked to a perfect medium rare and the pepper sauce that GG had chosen was really nice. A good gravy can be a highlight and this one was. Well…. they were two big courses right there! Would there really be room for a third? Well I had my doubts but it only took three words for me to be swayed – “Sticky Date Pudding”, served with warm butterscotch sauce and vanilla ice cream – $9.60. We are both big fans so ordered the same this time around. 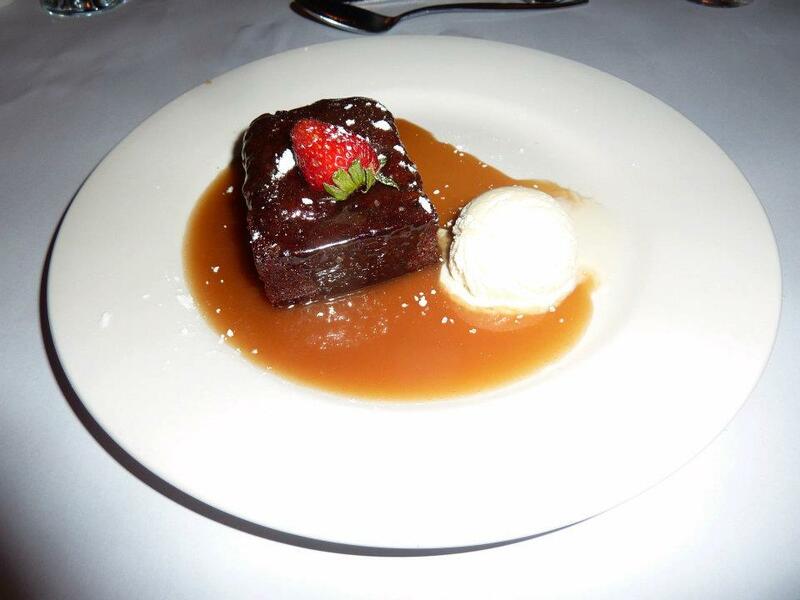 Beautiful moist cake, floating in a generous pool of warm, sticky sweet sauce with the creamy vanilla icecream. It was a delightful finish to our meal. So what had we thought of the Northwood? At the end of the day it’s pub food and I don’t think they are trying to be fancier than they are – there’s an endearing honesty to that I think. Servings had been generous, prices were reasonable (though we did have a voucher on this visit) and everything had been well presented. While it might not be as flash as some other pub nosh I’d had in the past, I had enjoyed my meal and definitely left on the full side…. gotta be happy with that! So glad to hear you had a good time Patrick! I’ve always found the food to be really tasty too and reasonably priced 🙂 A good local!